Season pork steaks with salt and cayenne. Place pork and onion slices directly over fire; grill pork for 8-10 minutes, turning once. Grill onion, turning as necessary to brown evenly, for about 5-6 minutes. 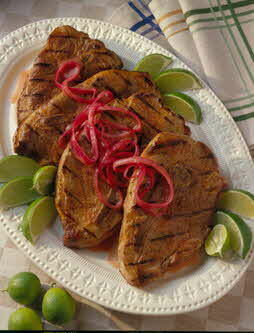 Place grilled pork and onion on serving platter; squeeze some fresh lime juice over and serve with remaining lime wedges. Wine suggestion: Serve with a chilled Sauvignon Blanc, cold beer or Sangria. This classic grilled pork dish from the Yucatan—Poc Chuc—is simplicity personified, but it’s loaded with flavor. Accompany with guacamole, warm corn tortillas and a corn and black bean salad in vinaigrette.